The Community, Local, & Regional Food Systems Photo Contest Winners are Out and the Calendar is Available! The conversations around agriculture, food, and community continue to bubble up in loca lities across the Commonwealth and the nation. County, city, and local government bodies see a benefit and overall positive impact in building a collaborative team among service providers and practitioners working to promote community, local, and regional food systems as an economic driver all while looking at improving food access, health, and nutrition options for all members of the community. The conversations are often messy at first where multi-sectors of the community are working together that may not have done so traditionally. These interwoven teams are often called “food councils” or “food networks” and have a much greater opportunity of success when we all work together. 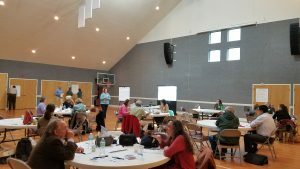 In the New River Valley, a four county region in southwest Virginia, a multi-sector team has formed around interests of increased food access, improved healthy food choices, and exploring collective infrastructure models that could improve the food available and distributed through food pantries, food kitchens, and food banks across the planning district. This effort was created by simple conversations of folks working in this arena, and has increased through mutual relationships, engagement, and connections. The Community Foundation of the New River Valley, a 501c3 non-profit, helps individuals, families, and businesses create and sustain a vibrant, supportive community, now and for generations to come. The Community Foundation matches donors’ unique interests, ideas, and passions with the charitable organizations making a positive impact in our region every day through many different projects and efforts. A major t heme of the Community Foundations efforts are to support increased food access opportunities throughout the region. As they began to see how expansive this effort was, it was proven that collaboration between organizations, agencies and service providers would be the best model for regional success. This is where the team began to form. 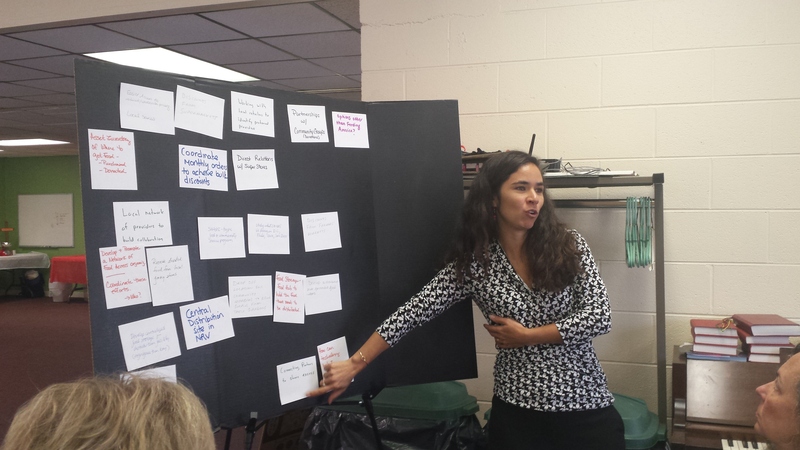 The Community Foundation of the NRV reached out to the New River Valley Health District, The Farmacy Garden Team, The Virginia Family Nutrition Program, and the local Virginia Cooperative Extension – Montgomery County unit to create an advisory team where we could brainstorm ideas on how to best work together and move forward. This advisory team quickly became, “the team” and now works as a management, core administrative team. 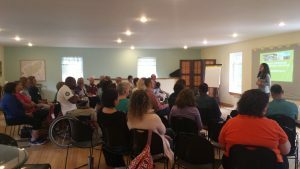 The group formed The New River Valley Food Access Network with an overall vision and purpose of relieving hunger in the NRV. Many more partners, including, local food pantries, banks, kitchens, local housing partners, elderly care facilities, youth backpack programs, community gardens, and faith based initiatives working in the area of food access have joined these efforts and are contributing to the info gathering and sharing. NRV Food Access Network Purpose Statement: In order to expand access to healthy food, we would like to share best practices, innovative approaches and encourage collaboration among the network of organizations working to relieve hunger in the New River Valley. Over the past year, the “Network” has hosted five Commun ity Conversations rotating locations across the four counties to bring folks together, define needs, share ideas, models, practices, experiences, resources (financial and educational), ask questions to determine what is feasible, and connect partners for collaboration on projects that would benefit the region. Community Conversation meetings framework consists of time for connection, facilitated discussion, brainstorming/idea generation, as well as tours of working pantries/facilities, and success stories/models from others doing similar work. 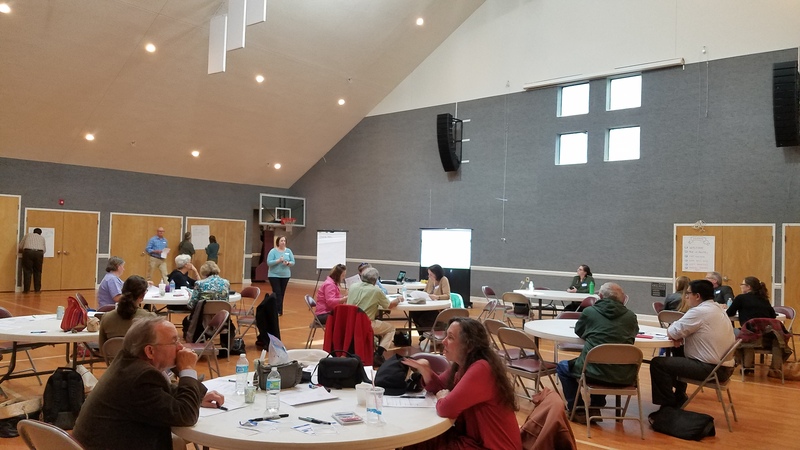 The results of these conversations have built relationships and increased communication through an online presence via a landing page on the Community Foundations’ website, a Facebook Page (NRV Food Access Network), and the creation of a regional service provider resource guide. 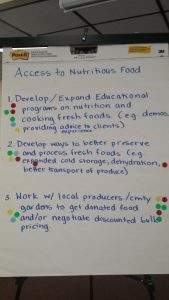 The Food Access Resource Guide is an ongoing effort to collect logistical data needed on who is serving food, what type of food, hours of operation, organization’s mission, etc. This guide is used to identify efforts across the region and connect members of the network. It was made possible by the collaboration with the Virginia Tech and the Virginia Family Nutrition Program. Specialists, coordinators, and students created a survey tool used to collect data that would populate the guide and make it useful to the entire group. The next steps are to “map” these connections creating visual of the network representing how we all work together. Outreach and Communication used to focus on engagement, growing the network, connecting with local governments, and continual strategic planning. Resource Guide Group will continue to focus on the resource guide for service providers, as well as a list of available feeding/food access sites for participants. Networking Mapping Group working with specialists at Virginia Tech, we are creating a survey questionnaire to define working relationships and the strength of the bonds across the region. This map will be a tool used to describe and shape the network. Much more work needs to be done. 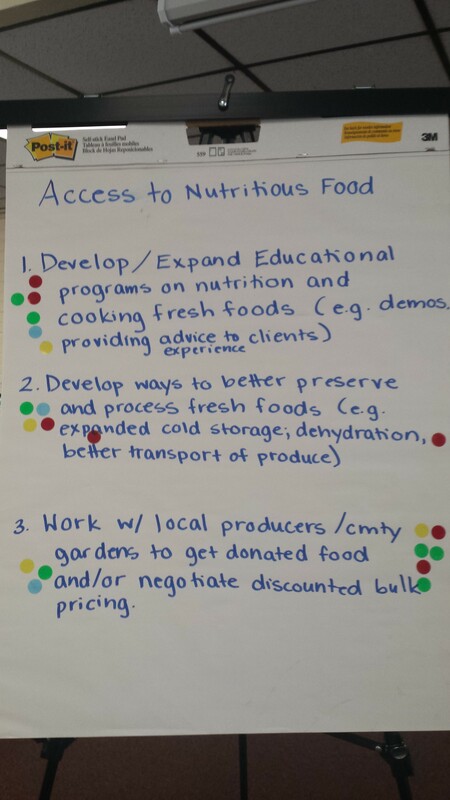 We look forward to continuing the conversation in the NRV around food access, distribution, and nutrition to see how collaboration and cross boundary connections can prove success in meeting the local needs across the region.